The text component renders signed distance field (SDF) font text. As a default, we’ve selected SDF-based text to be included as a core component due to its relatively good performance and clarity. This component uses mattdesl’s three-bmfont-text library. The standard text component has a long lineage, starting out as a community component and was forked and improved several times before landing into A-Frame! Here’s a basic example of text defining just the content with not much other configuration. See more examples to see configuration of alignments, anchors, baselines, scaling, and auto-sizing. Open any of these example scenes, hit <ctrl> + <alt> + i to open the Inspector, and play with all the possible values to see the effects instantly! The implementation is based on mattdesl’s three-bmfont-text. Read more about the text properties. We can specify different fonts, although the process is not as simple as Web Fonts. The text component defaults to roboto which uses a multi-channel signed distance (MSDF) font. MSDF helps to preserve sharp corners and edges. Select from one of A-Frame’s built-in fonts. These fonts will be loaded in from over a CDN. If you want your application to work better offline, download these fonts locally and point to them via a URL. Different fonts can be specified using the font and fontImage properties. If not specified, fontImage will be the font‘s name, but with the extension replaced to .png. 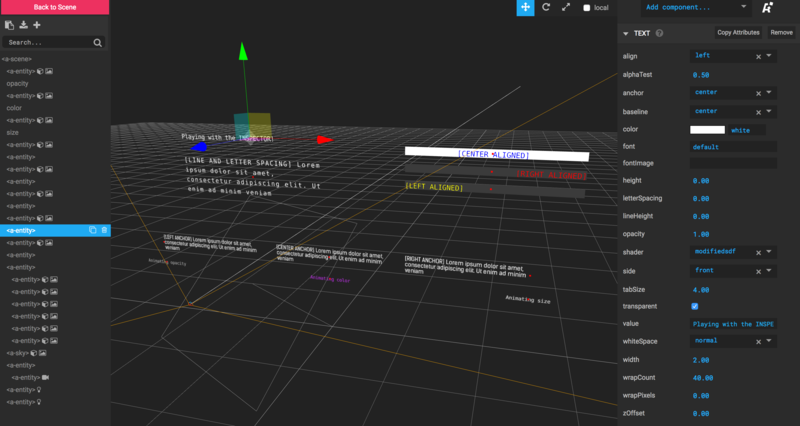 For example, if the font path ends with mozillavr.fnt, then the fontImage texture will default to mozillavr.png. On top of the stock fonts, we can generate SDF fonts using Hiero, a bitmap font packing tool. See this guide for generating SDF fonts. Change the wrapCount (roughly how many characters to fit inside the given width). Position the text closer or farther away. Text can be wrapped by specifying width in A-Frame units. 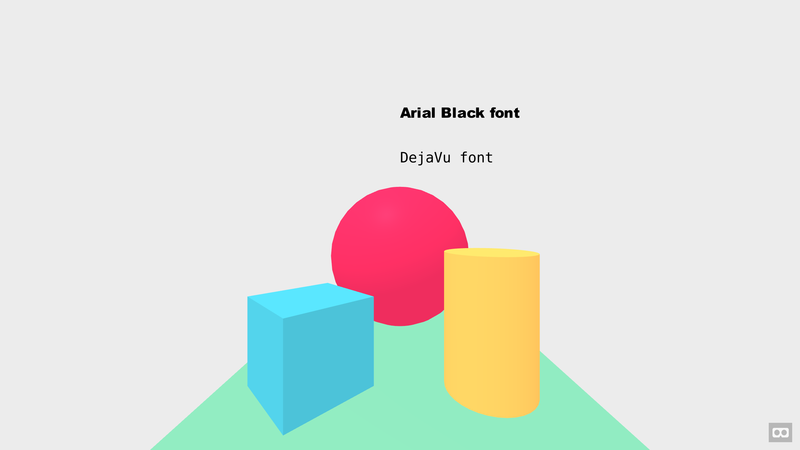 The text component introduces special behavior when using alongside the geometry component (e.g., a background plane) to fit. Note this only works with 2D-friendly geometries that define a width and height (i.e., box, plane). The text can either be scaled, bounded, or aligned in relation to the geometry, or the text can auto-scale the geometry to fit the text. geometry="primitive: plane; width: 4; height: auto"
geometry="primitive: plane; height: auto; width: auto"
Note that if neither geometry nor text specify a width, the text width property will default to 1 unit (meter), and the geometry width property will then become 1 unit as well. The text component does not make use of all of the features of the three-bmfont-text library nor its sister modules. Bitmap font rendering limits you to the characters included in the font (Unicode this is not). SDF font rendering tends to produce smooth sharp edges though there are ways around this. The generated text is not suitable for raycaster intersection testing. For raycaster or cursor detection it is necessary to use a geometry component along with the text component.